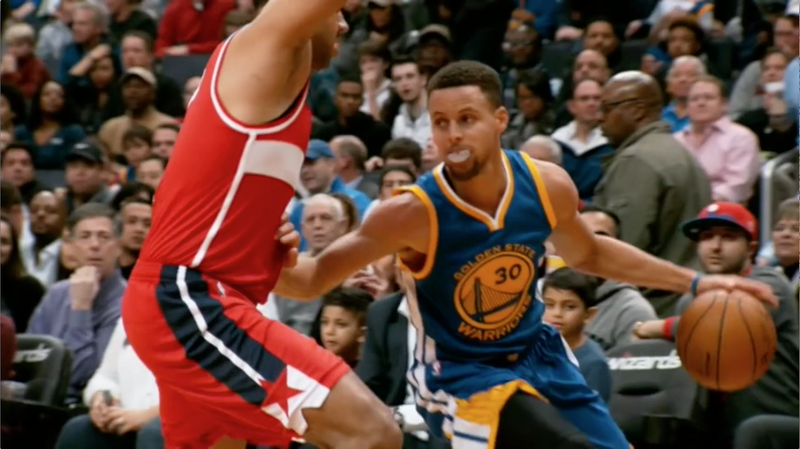 Golden State sharpshooter Stephen Curry keeps hitting 3-pointers and setting records. He just topped his own single-season mark, and there's still 24 games left. Here's a look at the numbers behind Curry's historic season in progress. Meet the new boss, same as the old boss. Stephen Curry now holds the top three spots on the single-season 3-pointer list and has been in the top spot since passing Ray Allen in the final game of the 2012-13 season. And consider this: This is Curry's sixth season in the NBA in which he hasn't missed significant time with injuries, and four of his 3-pointer totals are in the all-time top 10. Here's a look at all 288 of them, courtesy of NBA Savant . Curry shoots well from the corners, making 14 percent of his 3s from there (40 of his 288 on the season). In particular, he is dialed in from the left corner, where he's tied for fourth in the league with 24 made 3-pointers. From the right corner, he's not quite as prolific (16 makes). He is far and away the league leader in 3s made above the break (246, with James Harden second at 154). We've highlighted three shots with black dots: his record-setting 3 against Oklahoma City on Saturday, and the shot that won the game in overtime, in addition to his longest bomb, which also happened to be his 200th 3 of the season: a 48-footer from half court against the Pacers at the first-half buzzer. Curry shares the court with Klay Thompson (27.4 MPG) and Draymond Green (31.1 MPG) more than anyone else on the Warriors' roster, so it makes sense that they combine for about 80 percent of his assisted 3-pointers. It's more surprising that Andrew Bogut, a good passer for a big man who averages 4.8 assists per 100 possessions, hasn't fed Curry on any 3s. 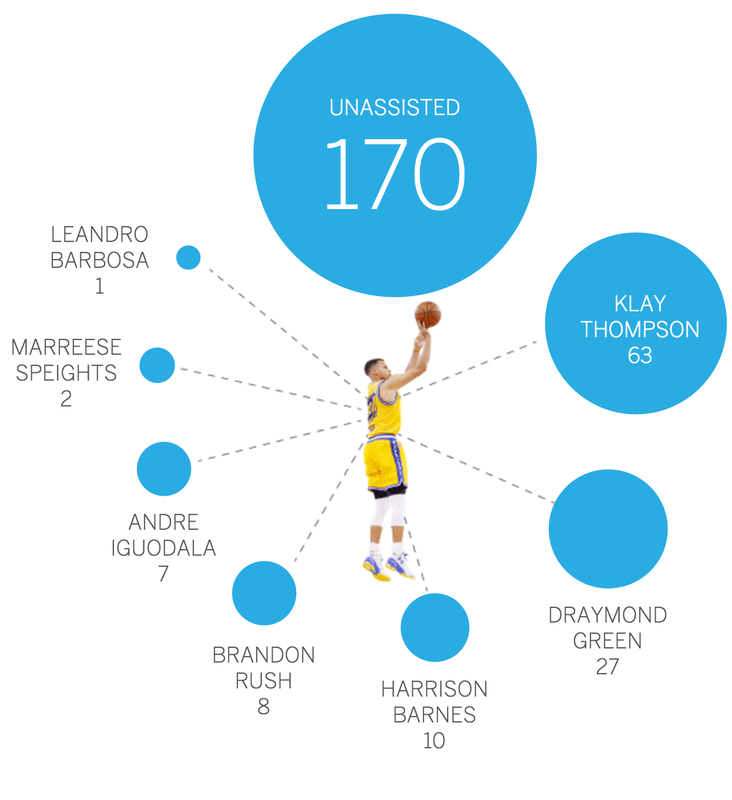 Even Marreese Speights managed two assists to Curry, and he averages just 0.7 assists per game. Curry's ability to hit fadeaway 3-pointers, a shot requiring extreme accuracy and balance, is remarkable. He has made 7 of 10 so far this season, and the rest of the league combined managed only 28 before Saturday's games -- so Curry accounts for 20 percent of them by himself. According to NBAsavant.com, only two players have hit more than one (Chris Paul and Brandon Rush both have two). 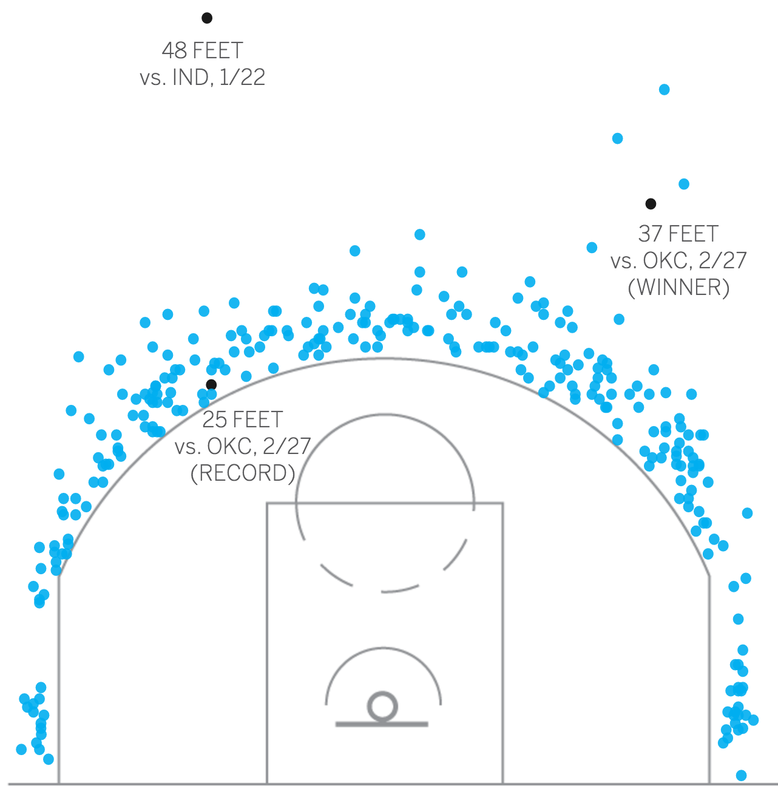 And last season, when Curry set the previous 3-pointer record, he hit exactly one fadeaway outside the arc. Strangely, his most common type of 3 (the standard jumper) accounts for most of his makes and attempts but he only shoots 39 percent on them (shooting 171 of 438). On pullups, however, he shoots a jaw-dropping 67 percent (80 of 120). Ethan Strauss, Warriors beat writer for ESPN.com: "What makes Steph Curry the greatest 3-point shooter we've ever seen? It's the versatility and the range. 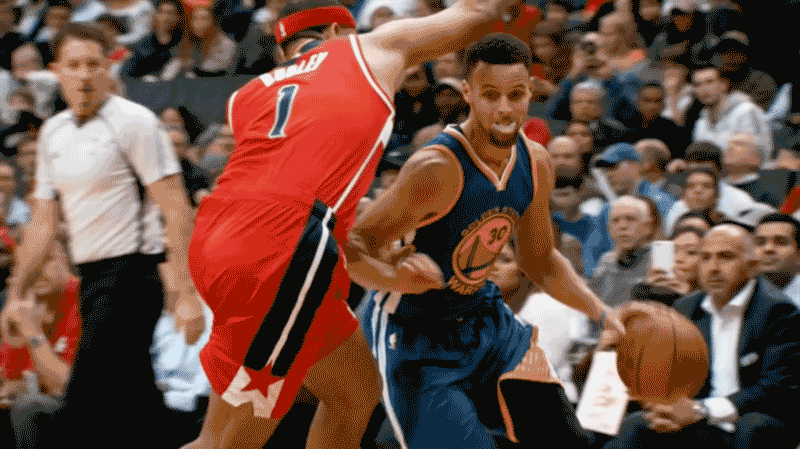 Not only can Curry fire 3s off the dribble with an accuracy never seen before, but he can do it from farther away. The range was all part of a strategy he's been developing for years. When a defender tries to run him off the line, he can always dribble a few steps back and make a mockery of modern defense."